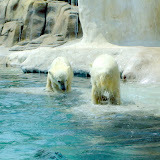 My hubby being the wonderful man he is made plans for my birthday and took me to the zoo..I LOVE YOU BABE! Thanks for a beautiful weekend! Here is a slideshow of our trip. CLICK ON THE PIC TO SEE MY PICS. looks like i can only post one slideshow at a time.